It is a satisfying but intensive week, with candidates often taking the Certificate of Competence exam (+2 days). Coastal Skipper is the minimum recommended qualification that organisations look for when chartering a boat. The club provides skillbuilder opportunities for club members working towards their qualification and is the minimum standard to apply to the Vice Commodore be a club offshore skipper, which provides plenty of follow on opportunities. see the RYA site here for more detail. Course Headline: This course is very much hands-on with little time to teach navigation or other theoretical subjects. It is therefore recommended that you take the RYA Coastal Skipper shorebased course prior to your practical course so you can put those skills into practice on the water. 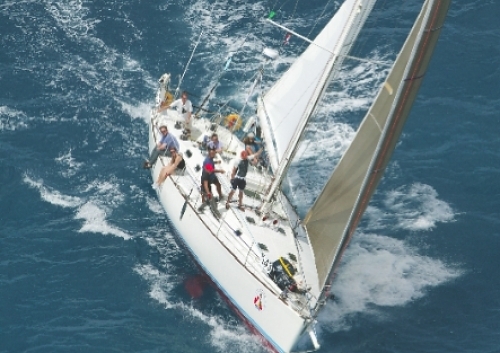 Course Description: :"The Coastal Skipper course is an advanced course, designed to teach skills and techniques required to safely skipper a cruising yacht on coastal and offshore passages by day & night. This course is the natural stepping stone between the Day Skipper course and the full RYA/MCA Yachtmaster Coastal certificate. Passage planning, preparation for sea, pilotage, passage making and ability to skipper, yacht handling under power & sail, adverse weather conditions, emergency situations." What's Included: RYA accredited instructor, accommodation on board, gas, diesel, breakfast and lunch each day, 4 evening meals. Mooring fees, which are split between the students, are not included. Prior Knowledge/Experience: Previous experience required 15 Days (2 days as skipper) 300 miles, 8 night hours. RYA Coastal Skipper Theory recommended. Next Steps: Cross Channels, further afield cruises and Racing with LCSC. For club members the opportunity to apply to the Vice Commodore to become a club skipper, taking part in an appraisal weekend, and joining the club skipper programme including further skillbuilders, mentoring and skippering on club events, and solent ralles organised by the RC Offshore and Membership Secretary. Ability after the course: The ability to skipper a yacht on coastal passages by day and night.